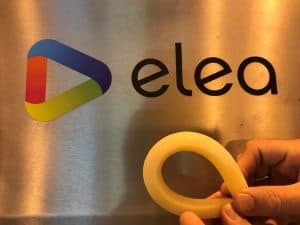 Pulsed Electric Fields (PEF) processing technology applies very short (microseconds) pulses of high voltage electricity to plant material placed between two electrodes (Oey, Roohinejad, Leong, Faridnia, Lee, & Kethireddy, 2016). In the deep-fried potato industry, potatoes can be subjected to PEF immediately after the sorting, washing and peeling step prior to cutting/slicing. The delivery of short electric pulses through the uncut (whole) potatoes during PEF processing alters the structural integrity of their tissues, which results in a more controlled release of intracellular compounds involved in the Maillard reaction, including reducing sugars and low-molecular substrates, and hence reduces the tendency of deep-fried potatoes to brown (Janositz, Noack, & Knorr, 2011). PEF-treated potatoes also have a more uniform brown colour and a reduced uptake of oil upon frying (Ignat, Manzocco, Brunton, Nicoli, & Lyng, 2015). This technology also offers improvement in processing efficiency as the softer texture induced by PEF makes the potatoes more flexible and easier to cut, which increases the durability of the cutting knifes, results in fewer broken chips leading to less waste, and provides the ability to develop new cut shapes (Leong, Richter, Knorr, & Oey, 2014). Recently, in Europe there has been much interest in the use of PEF by the potato chips and French fries industry and this technology is becoming increasingly used at a commercial level to improve product quality. To assess the potential advantages of PEF for New Zealand potatoes, researchers at the University of Otago, led by Professor Indrawati Oey (Department of Food Science), established a joint collaboration with Potatoes New Zealand, Elea Germany (PEF unit provider) and a large New Zealand based deep-fried potato producer to carry out a three-month industrial scale trial using a high-throughput PEF equipment. This trial was carried out as part of the Food Industry Enabling Technology (FIET Project 9) programme funded by the Ministry of Business, Innovation and Employment (MBIE). This project investigated the effect of PEF (by varying the level specific energy inputs and electric field strengths) on a wide range of potato cultivars used locally for the production of French fries and potato crisp products. Trials were also carried out to assess the potential of PEF to mitigate the product quality issues caused by the Tomato Potato Psyllid/Candidatus Liberibacter solanacearum pest/disease. 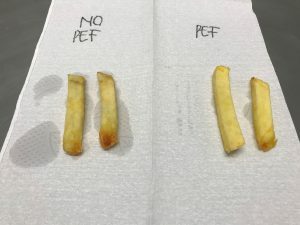 The commercial scale trials have been completed and currently the compositional (starch, sugar, amino acid, oil) and sensory properties (texture, colour) of the deep-fried products, produced using untreated and PEF-treated potatoes are being assessed. The kinetic behaviour of browning development of the fries/crisps during frying at different temperatures is also being assessed. The University of Otago research team will continue to work closely with the potato processing company to interpret the results of the trials. Ignat, A., Manzocco, L., Brunton, N. P., Nicoli, M. C., & Lyng, J. G. (2015). The effect of pulsed electric field pre-treatments prior to deep-fat frying on quality aspects of potato fries. Innovative Food Science and Emerging Technologies, 29, 65-69. Janositz, A., Noack, A. K., & Knorr, D. (2011). Pulsed electric fields and their impact on the diffusion characteristics of potato slices. LWT – Food Science and Technology, 44(9), 1939-1945. Leong, S. Y., Richter, L. K., Knorr, D., & Oey, I. (2014). Feasibility of using pulsed electric field processing to inactivate enzymes and reduce the cutting force of carrot (Daucus carota var. Nantes). Innovative Food Science and Emerging Technologies, 26(0), 159-167. Oey, I., Roohinejad, S., Leong, S. Y., Faridnia, F., Lee, P. Y., & Kethireddy, V. (2016). Pulsed electric field processing: Its technological opportunities and consumer perception. In J. A. K. (Ed. ), Food Processing Technologies: Impact on Product Attributes, (pp. 447-516). Boca Raton: CRC Press.